In the figure below, angle BAC is an inscirbed angle and angle BOC is the central angle of circle O. Both angles are subtended by the same arc. 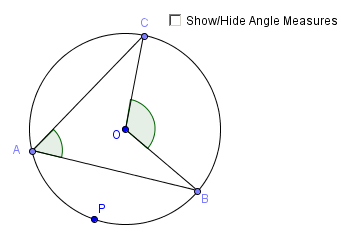 Make a conjecture about these two angles. Check the Show/Hide Angle Measures check box and move any of the points. Is your conjecture always correct? Prove your conjecture. Kroger or The Kroger Customer Feedback Servey Company is an American retail company, it is also the largest United States’ largest supermarket chain. Your web site is nice. But I am too old for these posts. No offense.